claass HAUS is finally back (and fully recovered) with this William Kessler design. ​First, let me apologize for my extended absence- a mystery illness took me down for a few weeks, but after a short stint in the hospital and plenty of meds, I'm feeling more like my architecture-obsessed self these days. So let's get back to it. If you know much about Michigan modernism, you probably know the name William Kessler. One of the state's most influential modernists (called "the dean of Detroit's architectural community" by the Detroit Free Press), Kessler spent a long, productive career creating technologically innovative and formally expressive modern buildings. After studying at Chicago’s Institute of Design and learning the ways of the Bauhaus under master Walter Gropius at Harvard, Kessler relocated to Michigan during the early 1950s following an offer from Minoru Yamasaki to work in his growing Detroit firm. Though Kessler initially only intended to stay in the state for a few years, the young architect, impressed with the region's remarkable ability to fuel creativity and innovation, eventually established his own firm in Grosse Pointe and remained in Michigan for the rest of his career. ​Best known for his attention to human scale and experimental engineering, William Kessler helped shape Michigan's (incredibly) inventive architectural legacy during the second half of the twentieth century. Although Kessler's most recognizable building is probably his own residence in Grosse Pointe, his design for the Mt. Clemens Federal Savings and Loan Association perfectly encapsulates the architect's penchant for bold expressionism. Characterized by a dramatic, undulating roof, the bank design is nothing if not a daring display of Kessler magic. Edward Olencki, Mt. Clemens Federal Savings and Loan Association. Courtesy of Art, Architecture and Engineering Library, University of Michigan. Courtesy of the Joseph Messana Architectural Image Collection, University of Nebraska-Lincoln Libraries. In the early 1960s, Mt. Clemens Federal Savings and Loan Association president, A.D. Brewer, sought to build a new bank that would be "as breathtakingly modern as the automobile, airplane and the space missile." Pretty big dreams. But Brewer saw the new bank building as the architectural showpiece of Mt. Clemens, a suburb located about 25 miles north of Detroit, and hired Kessler, by then a well-established modernist, to design the futuristic space. With all of the swoop and swagger of the Space Age, the Mt. Clemens bank sits above the street like a temple to modernity, the twisting white form catching the eye with its sculptural acrobatics. Round columns located at each of the building's corners support the thin-shell roof, allowing a glazed curtain wall to fill in the space between supports. The result is an impressive feat of engineering- the structure's shiny expanses of glass offering an overwhelming sense of transparency and openness between the heavier concrete forms. Kessler's playful take on a modern financial institution continues with the slightly arched roof flaring upwards at each corner in a gentle wave. With a little bit of creative mischief, Kessler's bank design is an unexpected breath of fresh air, a sculptural embrace of the period's architectural possibility. On the interior, the absence of structural supports allows for a flexible and adaptable space. 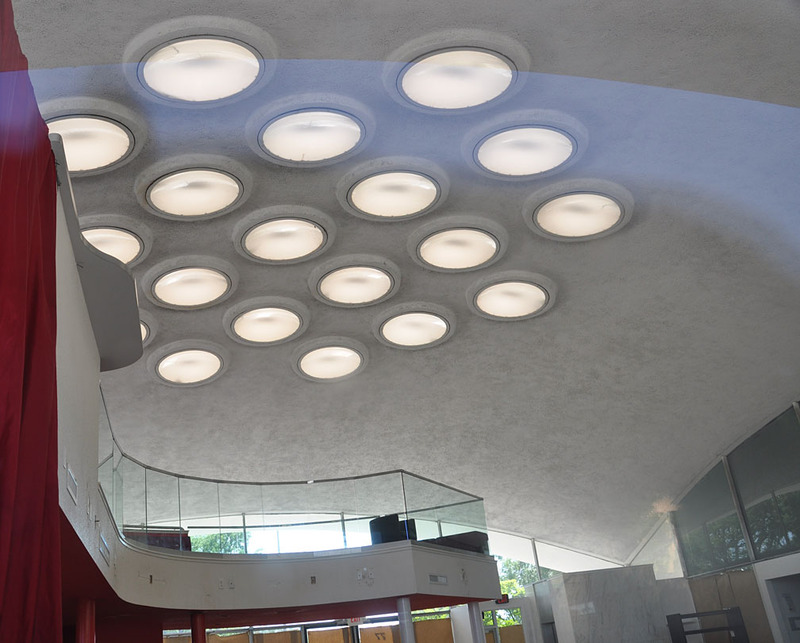 The bank's two-story lobby, located in the center of the building, is showered with natural light from more than twenty round skylights that perforate the domed roof (you can see an image here). Originally, the open lobby consisted of eight teller booths and a freestanding vault. Interestingly, Kessler's plan also included a "community room" to be used by both employees and civic groups. The new Mt. Clemens Federal Savings and Loan Association opened in 1961, and locals quickly dubbed it the "flying nun"- the unique roofline resembling a nun's habit. After serving as a financial institution for more than four decades, the building was converted into a nightclub in 2008 following a $1.2 million renovation (with the interior redesigned by William Kessler's daughter, Tamara). Just two short years later, the nightclub owners filed bankruptcy, and the bank building was again put on the market. But despite the frequent changes in ownership, the building still survives, its flowing concrete form a wink to Kessler's distinctive (and often underrated) mode of modern architecture. You can read about another Kessler design from the same period here. William H. Kessler, architect, and Balthazar Korab, photographer. Mt. Clemens (1961). Courtesy of the Library of Congress, 2017650171.